– These protests are being organized under the banner of national unity and reconciliation. However, we emphasize that resolving the predicament of Palestinian disunity must be based on principles and values agreed upon by the Palestinian people regardless of their political affiliation. The first of these principles is the illegitimacy of imprisoning people based on their political beliefs. Consequently, we demand the release of all political prisoners held by the government in Gaza and the Palestinian Authority in the West Bank. – Democratic Palestinian National Council (PNC) elections based on a one-person one-vote electoral system that guarantees equal representation for all Palestinians around the world (Gaza Strip, West Bank, 48 territories, refugee camps, and in the Diaspora). This necessitates a complete overhaul of the PNC’s structures and the establishment of new electoral procedures. Palestinian political parties, Hamas’ government in Gaza, Fayyad’s government in the West Bank, and a plethora of nongovernmental organizations are seeking to co-opt this movement to serve their narrow interests. Moreover, they are attempting to legitimize themselves by falsely stating that they are the main organizers behind this event. We open-heartedly welcome the participation of party members and NGO employees, who are an essential and inseparable part of our societal fabric. We do not welcome attempts by their leaders to redirect our efforts. – We affirm that the March 15th movement is by the people for the people, and is independent of any political party or institutional backing. It is being organized by non-partisan youth groups who dream of a better future for their people. 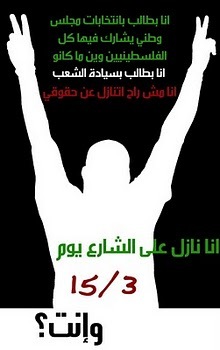 We invite all Palestinians, and particularly Palestinian youth, to come down to the street on March 15th. We will only carry Palestinian flags, and chant and sing for freedom, unity, and justice. March 15th shall be the day we stand in unity to demand democratic representation for all Palestinians as an affirmative step in our struggle for Freedom from Israeli Apartheid. العنصري ضد شعبنا في الداخل الفلسطيني، وحق العودة للديار كما تنص عليه قرارات الشرعية الدولية. نحذر من محاولات بعض الجهات لتجيير فعاليات الخامس عشر من آذار لمصلحة أهدافها السياسية الفئوية، وخاصة بعض المؤسسات الشبابية و الأحزاب السياسية والحكومات التي تحاول احتواء نشاط الشباب و”شرعنة” نفسها من خلال محاولة اظهار النشاط وكأنه من تنظيمها. نأكد على أن تحرك الخامس عشر من آذار تحرك شعبي غير تابع لأي فصيل أو مؤسسة، وهو ملك الشباب والشابات المتظاهرين. ندعو جميع فئات الشعب الفلسطيني وخاصة الشباب إلى النزول للشارع يوم الخامس عشر من آذار لرفع العلم الفلسطيني فقط، دون شعارات أو أعلام أو ألوان حزبية للتأكيد على رفض تجيير الفعالية لأهداف أو مطالب حزبية أوغيرها. هذا يومنا للمطالبة وبوضوح بانتخابات مجلس وطني فلسطيني جديد كبداية ترتيب صفناالداخلي وإعادة بناء مشروعنا الوطني الهادف لمقاومة الأضطهاد الإسرائيلي بكافة أشكاله.